I thoroughly enjoyed Shifu Li Chang Dao’s book, and it certainly lived up to the title: it is, indeed, a marvelous journal chronicling the eighteen-year journey of Michael Rinaldini’s personal progress as a Daoist priest and practitioner. In Michael’s book, I appreciated the insights and learned the value that solitary retreats offer for the purposes of awakenings and realizations. I also obtained a deeper understanding of several meditation and qigong methods, and of Daoist alchemy. One of the most inspiring moments was his retelling of the experience when he followed the flow of universal energies and intuitively created a new qigong form! As a mystic who has had my own direct experiences of the underlying Truth of the Universe, I especially appreciated Michael’s deep sharing of his connection to Universal Oneness, “cracking the matrix” as he calls it. The nugget I take away from reading Shifu’s book is that the goal of Not Two is very obtainable if one applies oneself with dedication and courage; one can have the explicit awareness and experience of Oneness. 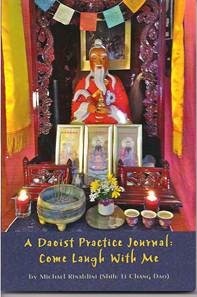 This entry was posted in Book Reviews, Daoism, Uncategorized. Bookmark the permalink.